Expert pest control for all of Brisbane CBD and surrounding areas, reaching from Caboolture to Ipswitch. Chem-Dry Amazing specializes in controling carpet eating moths, beetles and dust mites. Chem-Dry Amazing Carpet and Pest Control provides industry leading service at competitive prices. We can also clean your carpets, beds and furniture, assess the damage and make recommendations on how to control the pests from ruining your carpet and furniture. Insect problems throughout Brisbane will be quickly controlled with our quality pest control products. Certain types of mites are parasitic on humans & will occasionally infest buildings. Often associated with wild or domestic birds or rodents, mites are very small (about the size of the period in this sentence) and are closely related to ticks. Dust mites feed on shed human skin (beds, or cloth furniture are often filled with expelled skin since this is where people spend the majority of their time sitting or lying for extended periods). Excrement from the dust mites may trigger allergic reactions and asthma in some individuals, and can be hard to control. Often Infestations go unnoticed for some time. 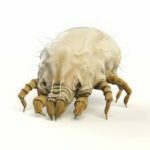 Our technicians can effectively control dust mites throughout Brisbane with our carpet sanitizing and our anti-dust mite allergen spray that helps reduce the dust mites in your home. Moths including clothing moths love to live in dark, dirty and humid places where nobody disturbs them for long periods, and Brisbane has the perfect weather for them all year around. Occasionally these pest will invade your pantry, carpets under furniture or clothing closet. Our pest control technicians can control moths in the Brisbane CBD area safely, with our sprays and moth traps, in addition to providing a safe clean carpet with our Chem-Dry carpet or upholstery cleaning. 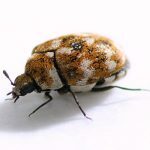 Carpet beetles thrive in homes, museums, warehouses and other places where food exists. The young beetles look like tiny, hairy worms, and they like to feed in dark, undisturbed places like behind sofas and chairs, under furniture, and in carpets. Depending on your location, one type of carpet beetle may be more common than others. But at Chem-Dry Amazing, it doesn’t matter, we will clean them up and we can clean the carpet also! Fleas are parasites that feed on blood, and seem to prefer humans, cats, dogs, opossums, and rodents. A flea can jump up to 8 inches high and are usually found on shoes, pant legs, or blankets. Consequently your pet may infest your entire home with these pests. If you are moving in or out of the home, our technicians can clean your carpets and spray your home to protect you and others from any possible flea infestations. Cockroaches transmit diseases, contaminate food, and induce allergies. They love Brisbane’s warm, humid climate and can be found in even the cleanest home or business. You probably have them too! Some female cockroaches mate once and are pregnant for the rest of their lives. Our technicians can help keep the roaches from getting your family sick. Call us today at 1800 017 925 for a quote.